Need a centerpiece for a crawfish boil or seafood buffet...get creative! 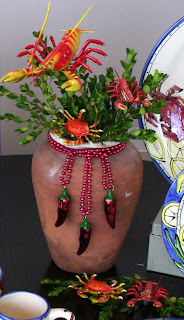 Layering different crawfish or seafood items in and around a vase creates a unique centerpiece. This urn style vase that I have used before in a previous post makes an ideal base for a centerpiece. The neck on the vase allows you to add beads or ribbon accents and the 10" height of the vase works well in the middle of a table. For this centerpiece, Drape three chili pepper beads around the neck of the urn. Twist each bead together a few inches up from the chili pepper to make it hang straight down. Wrap the remaining length of bead around the neck. Varying the lengths and distance of the hanging chili peppers adds interest. For some texture and color contrast, I clipped boxwood branches from the yard. The green of the boxwood branches makes the red crawfish color pop. Boxwood branches are great greenery for centerpieces because they stay looking fresh for days, maybe even weeks. Layered on top of the boxwood branches are fun Bobble Crawfish Picks and Crab picks. These realistic looking crawfish and crab on picks have springs attached at the arms and legs so they "bobble" around like real crustaceans. MardiGrasOutlet.com carries a large selection of bobble beads, picks and magnets. I added two sizes of the crawfish pick and a crab. At the base of the vase are a scattering of more boxwood branches, crawfish and crab figurines on magnets. Since the magnet is on the bottom, it does not show. You could also scatter these small metallic red crawfish around the table like confetti. For added sparkle, drape chili pepper beads and/or red metallic crawfish beads down the center of the table. Personalize it with your own flair! We've made even more crawfish boil centerpieces to inspire you!